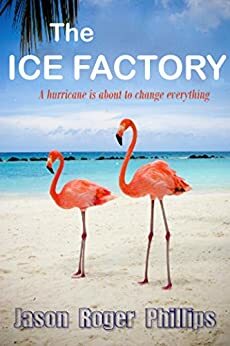 The Ice Factory follows hurricane victims as one struggles to get the only ice factory working again. The premise seems simple, but what ensues is a fun and engaging story. What was your inspiration for this story? They say fact is stranger than fiction, the book is actually inspired by a true story, which was cruel, ironic and hilarious. I started writing after watching a documentary about a caribbean hurricane, which seemed a perfect metaphor for personal upheaval and survival. I loved reading the differences and similarities between the way Joy and Audrey viewed the world. What were some themes you wanted to capture when writing their characters? Joy represented old fashioned decency & dignity (values which i remember from the caribbean, especially of my grandparent’s generation). Audrey shared the same values at heart, but surrendered her heart to a husband who slowly eroded those values over thirty years. just when all seems lost, with a little encouragement from those who saw the best in her, in rebuilding the ice factory audrey was able to rebuild herself. The Ice Factory is your debut novel. What were some things you wanted to accomplish as a writer in this book, and what were some lessons learned? I really had no expectations other than bringing out all the colourful eccentricity of caribbean characters, and seeing where that would lead. My characters became so vivid that I couldn’t wait to see what they would do next, and all I had to do was type what they revealed. The publishing experience, however, was a steep learning curve, the biggest lesson… never submit a final draft until you’re absolutely certain it’s FINAL, and confident enough to let go completely. There’s nothing worse than discovering a mistake after the book is published. I am working on an Australian epic set in the nullarbor desert, again inspired by a true story. The working title is ‘terra nulla’, which I hope to publish in 2018… fingers crossed! When Audrey woke up on the kitchen floor, she didn’t expect to find herself in the news. But there she was, for all the wrong reasons, and now it seemed all of Trinidad & Tobago was laughing at her. By divine intervention, her path leads to the neighbouring island of Grenada – once a jewel of the Caribbean, the tiny nation faces its darkest hour in the aftermath of Hurricane Edna. The natives are restless: having no electricity, no homes, plenty of heat and no ice for their grog. 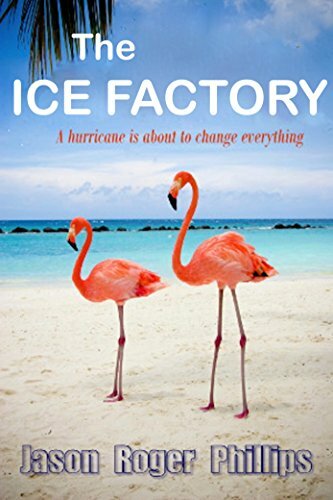 Audrey is about to face the biggest challenge of her life, as the new owner of the Ice Factory. Voodoo Child follows Army chopper pilot Maggie Child after she’s shot down over Iraq and her well-ordered life spirals into a paranormal nightmare. What was the inspiration for creating a zombie novel with such a strong female protagonist? The positive feedback I’ve been getting about Maggie is really satisfying because it was kind of an outside the box decision. I thought moving away from the standard male action hero would give the books a unique perspective. The zombie genre tends to have main characters that are either Delta Force operators, or Joe Everyman heroes who blossom into post-apocalyptic commandos, so I wanted to go in a different direction. With Maggie Child I wanted to create a protagonist that was strong and capable, while still being emotionally vulnerable. That’s especially important given what she has to endure over the course of the book. Maggie is a trained soldier but her compassion and embracing her spiritual side will become her greatest strengths. I think she’s someone readers of both genders can get behind. Maggie, Sarafina and Lavonia are the three main characters of this tale and they couldn’t be more different from each other. Which character do you feel you relate to and why? Well each of the trio represents a distinct facet of human nature, with Maggie as the person of action, Sarafina as the spiritual and emotional conscience and Lavonia representing our basest instincts. I suppose Maggie is the one that I and probably most other people would relate to. We all hope that if a great duty were thrust upon us we’d rise to the challenge like her. I think it will be fun to watch her blossom from a good, strong person into a truly great one. BUT I freely admit that Lavonia is always a blast to write because she’s such a shameless, self-centered sociopath. She’s irresistible. There are a lot of zombie novels out there. How do you feel Voodoo child stands out from the rest? The biggest difference was taking zombies back to their supernatural, voodoo roots. The current wave (or tsunami) of zombie novels are inspired by George Romero’s Night of the Living Dead, which reinvented zombie mythology. Thanks to Romero’s influence literary and cinematic zombies have evolved into thoroughly modern monsters, usually the byproduct of a mutated virus, military experiment or some other consequence of our technological society. That’s ironic because zombies are actually rooted in traditional Caribbean Voodoo- a very agrarian culture that hasn’t changed much in centuries. Taking zombies back to their voodoo origin allows me to explore the rich tapestry of voodoo spirits and legends. Later novels in the series will dive more deeply into that realm. It also meant I could discard the current “Zombie Rulebook” while inventing my own mythology. I think readers will enjoy the ride. Another difference is focusing on a core group of female lead characters, both as heroes and as the main human villain. I think that casts a unique light on the genre. I enjoyed exploring the characters relationships, particularly with Maggie, who, coming from an army background is very guarded about her femininity and romantic relationships, whereas the Sarafina, the Voodoo priestess is completely guided by her heart and emotions. They make an unlikely duo that not only forms a deep friendship, but also bond as master and pupil. And finally there’s the slightly twisted humor that underscores the action, which I hope is a welcome addition. Maybe Voodoo Child is the zombie novel for people who are growing weary of zombie novels. Voodoo Child is the first book in a series and it does an excellent job of setting the stage for the story to come. Can you tell us more about where the story and characters go after book one? We’ll discover that the supernatural forces at work will embolden other Voodoo spirits to come forward and assert themselves, turning the island of Fantomas into a brave new world of gods and monsters. This includes Marinette- The Lady of the Screech Owl, a spirit from the traditional Voodoo pantheon that’s considered so horrible only an insane person would evoke her. Pages from the ancient Voodoo spell book have been scattered across the globe, placing great power in the wrong hands. Sarafina will try to use her portion of the ancient text for good, but she’ll struggle with the book’s power to corrupt even the purest of hearts. Maggie will be grappling emotionally with her new role as a more than human warrior. To achieve that she’ll have to embrace her spiritual side, which isn’t easy for someone who, until recently, was a professed atheist. Plus (without throwing in too many first book spoilers) Both Maggie and Lavonia will be struggling with some severe mommy issues. The US Navy is heading for Fantomas to quarantine the island and render aid to its citizens. That won’t end well at all. Plus Talos Corporation is still in the mix and another rouge nation (not mentioning any names) has its eye on Fantomas. And of course Lavonia wants her lost money back, even if that means unleashing a zombie army to do it. It’s going to be full of fun, surprises… and monsters. Army chopper pilot Maggie Child has a reputation for being fearless, professional and, above all, rational. But when she’s shot down over Iraq her well-ordered life spirals into a paranormal nightmare. Alone, wounded and surrounded by hostile forces, Maggie is rescued from certain death by a demon straight out of Dante’s Inferno. Then, barely alive, she’s abducted by a private military corporation conducting insidious medical experiments. Her escape from their covert hellhole lands her on a Caribbean island where an evil voodoo spirit and a psychotic female dictator are conspiring to unleash an apocalyptic zombie plague. Then she uncovers the most terrifying secret of all—her own destiny. It seems a Voodoo oracle has ordained her the only warrior capable of saving humanity from a supernatural Armageddon … whether she wants the job or not! But saving the world isn’t a one-woman job, so she teams up with a trio of unlikely heroes—a conspiracy obsessed marijuana smuggler, a Voodoo priestess with an appetite for reality television, and a burnt out ex-mercenary. Together, they’ll take on an army of the walking dead, with the fate of humanity resting in their eccentric hands. 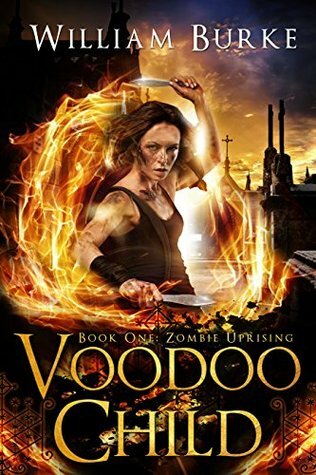 Voodoo Child, Book One: Zombie Uprising is the first novel in a new horror series packed with supernatural thrills, rousing adventure, dark humor, Voodoo lore and plenty of zombie stomping action. But a word of warning; don’t shoot these zombies in the head … because that just makes them mad! William Burke’s Voodoo Child is an engaging, if not slightly creepy, adventure to a tropical island plagued by greed, witchcraft and humanity. With Maggie Child as our main character, this strong female lead finds her life turned upside down when a tour in Iraq ends up landing her in a research facility. After undergoing an intense experiment it’s her wits and savvy that spring her, and fellow captive Glen Logan, from their captors. Using her family connections Maggie ends up bringing Glen along for the ride as they escape to the Caribbean Island of Fantomas. Neither of them is prepared for what lies ahead. The island has descended into chaos thanks to the joining of a money-hungry woman and one of the strongest spirits in Voodoo lore. This isn’t a tropical vacation that will leave you with a tan. You’ll be lucky to leave with your body intact. Don’t let the eighty-four-chapter count intimidate you. Many of the chapters are short, carrying important information in succinct little pages. Burke knows how to engage his audience as his cast of strong female leads aren’t ready to lay down and accept their fate. Maggie, Sarafina and Lavonia are the three main characters of this tale and they couldn’t be more different from each other. On one hand you’ve got Maggie, who is an army chopper pilot who isn’t afraid of anything and not about to take sass. Sarafina is the lovely Voodoo priestess who has inherited her title at a young age, but don’t let her youth fool you. Lavonia is a greedy former beauty queen looking to make a fast buck and is ill-prepared to deal with the consequences of her desires. These three cross paths in the most interesting of ways on the small island of Fantomas. Burke weaves his tale and captivates his audience with ease. Voodoo Child is the first book in a series and it does an excellent job of setting the stage for the story to come. The first volume can make or break a series and Burke seems to understand that as he lays out the world in which his characters live. 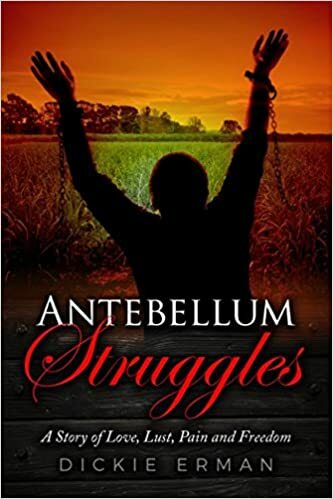 The relevant characters have their back stories tenderly flushed out and the basics of Voodoo, which is an obvious major part of the tale, are carefully explained. Since Voodoo is a real religion Burke must have had to research and ensure that what he is portraying in his story is correct. The care in which he takes in explaining the various rituals reveal that he did indeed do more than spend five minutes Googling the subject. 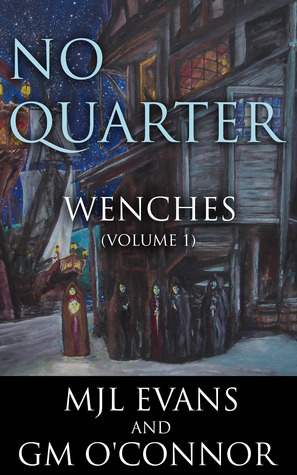 If the chapter count hasn’t scared you off you’ll find yourself entangled in a mess of zombies, arrogant humans and spiteful spirits out to take what is theirs. The chaos has meaning and while there are horrific moments in the story none of them feel overdone or out of place. If horror stories are your thing, you’ll definitely find what you’re looking for within the pages of Voodoo Child.